Le Petit Village is like a petting zoo. Dogs are out and about unleashed at all times and we are overrun with feral cats (my mother would die, just die if she saw them - not a cat fan). We are in desperate need of Bob Barker and his spaying and neutering ways. And these cats aren't cute cats that you would consider taking home for a cuddle, these things are some of the ugliest cats ever seen. They look like they have survived some sort of nuclear disaster. There is one (who has been alluding me as I've been stalking the village with my camera) that is mostly black, with beige bits here and there, and with a half beige face. From far away he looks like half of the fur on his face has been blown off and his little kitty skin is out. Not a good look on a cat. (Really wish I had a picture of this one, sorry). And then the dogs; all of them are allowed out without a chaperone (except Fifty, poor Fifty, his mommy goes with him everywhere. The other dogs probably make fun of him. Now I feel bad). They chase tourists cars running and barking behind. They are the anti-welcome wagon. How lazy can you be horse? What are you taking a break from? Your busy day of standing? I like to yell things at them while driving by (only while driving, if I was out walking they might chase me and that would be scary) Like.. "you're all food, I'm going to eat you!" Sugar Bear, well he's too cute to make fun of. He was given to me (I have know idea why I think Sugar Bear is a boy but we are going to go with that) by Bonnie at The Muse30. Bonnie is an aspiring author and while her blog deals with many entertaining daily life tidbits, lately, she's letting us into her novel writing process more and more which is a treat; story boards, index cards, outlines. It's inspiration for that novelist inside each of us. 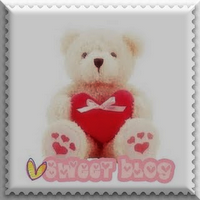 I now bestow Sugar Bear and The Beary Sweet Blog Award to Mimi at Bonjour Romance. If you love Paris and romance, then Mimi's blog is for you. She'll put a little ooh la la in your life! mums the word on the whole, "I'm going to eat you" thing. I never pass up the opportunity to tell my vegetarian mom whenever I cook rabbit...she thinks I'm eating Thumper, just tickles me silly. Stray cats are a problem over in my little village too. The dogs are all expensive pedigrees (except for ours, he cost 40 euro at the pound and that was plenty enough) and they all have complexes. One woman actually told me that she keeps her dog's toothbrush next to hers in the bathroom...um...ok lady. To each his own. Has the sun come out yet? I'm drowning in all this fog and rain. I'm sure that Fifty is doing just fine unless you make him wear booties...Maya (my dog) even makes fun of dogs that wear booties! Oh, feral cats, euh! I don't know if you ever watch the tv show Family Guy, but there's this great episode where Peter sprays something called Sick Cat Spray, and all of these sick cats come up and start rubbing on him, it's hilarious and this totally reminded me of that! I love cats, but not that kind! Thanks for the morning laugh, glad my blog inspires you for decorating, but we have to find you a house first! XO! I love kitties, but, yeah feral cats are difficult. I wish more places did spay and neuter stray cats and dogs. It would make such a difference. The title of the post totally made me laugh! Awesome... you're living in the middle of a wild animal park. And you're not even in Africa! "Hey horse, are your legs broken or something? Cuz, that'd be reeeal bad." Hey sheep, let's play follow the leader. I'll be the leader, because you're sheep!" "Hey cats. Meeoowwyur ugly! Thank you so much for sharing this award with me, I gladly accept little Sugar Bear! Will post on it asap. What's up with all these ugly cats? Perhaps the horse is just bored, and of course mum's the word on you know what! Ahhh the French life! That's what I call justice. Not EVERYTHING in France can be chic and gracious. Something's gotta give. Et bien t'as bien fait Sara! Nice blog.